This post originally appeared at Spellbound Scribes. Writing science fiction and fantasy is fun, and in my opinion, world-building is the bestest most funnest part. Whether you’re writing urban, historical, or alt-world fantasy, or a science fiction set in a galaxy far far away, world-building is a crucial part of the story-telling process. The world (or universe!) you create must be complex and multi-layered; it must be a place your characters operate in and interact with; and it must set the stage for your plot. It’s no easy task, and there are countless pitfalls at every stage of the process of creating a world. Read to jump in? Here are my top cliches and tropes to avoid, listed in no particular order. This is one of the biggest and easiest traps to fall into. Earth’s history and many cultures are far-reaching and complex, and it can be tempting to borrow elements whole-sale without bothering to do much work creatively. Think of how many famous fantasy worlds resemble Medieval-era Earth completely, right on down to the rampant sexism and casual racism (*cough* Westeros *cough*). There’s nothing wrong with using our world’s history and cultures to inspire your made-up world, but make sure it doesn’t become a lazy short-cut. If there’s sexism or lack of diversity in your world, you need a better reason than “that’s how things were back then.” You’re writing fantasy, not historical fiction. Get creative! Hello, wonderful people! No regular post today, but be sure to hop on over to the Spellbound Scribes where I’m giving tips on how to perfect the elusive art of character voice!! Check back later this week for a return to regular posting! Hello, my lovelies! No regular post today, but be sure to hop on over to the Spellbound Scribes where I’m discussing the difference between magical realism and fantasy! Hello, my lovelies! No regular post today, but be sure to hop on over to the Spellbound Scribes blog to read about my fool-proof cures for book hangovers! Don’t know what a book hangover is? Don’t worry, I explain it in the post. Good morning readers! No regular post today, but make sure to check out my monthly post over at Spellbound Scribes! Today I’m talking about why I write, read, and love fantasy! The magical land of Alban has fallen under the tyrannical rule of King Keldec, and Alban’s once generous and kind populace have become fearful and downtrodden. Once a year, the King’s Enforcers ride out on a Cull, killing everyone who dares speak out against Keldec while Enthrallers use mind-scraping techniques to turn anyone with useful magical gifts into pawns of the tyrant. Sixteen-year-old Neryn is graced–or cursed–with the canny gift of Sight; she can see the Good Folk even when they seek to hide themselves from mortal eyes. But because of her gift she has been forced to lead a life of danger and worry, constantly moving from one place to the next with her father in order to escape the long arm of the King’s Enforcers. And when her drunken father gambles her away to a stranger for a handful of silver, she fears that everything is lost. But the stranger reveals himself to be a mysterious warrior by the name of Flint who has no intention of harming Neryn. Now Neryn must make a choice: will she take her newfound freedom and find a place to hide out from King Keldec’s Enforcers permanently, or will she try to make her way to Shadowfell, a secret stronghold spoken of only in whispers? Can she trust Flint, or does he seek to betray her? And can she accept the terrifying destiny waiting for her at the end of her journey? I have never read any of Juliet Marillier’s novels before, but I’m glad I picked this one out at the library. 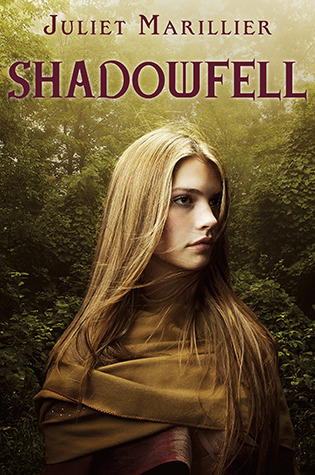 Shadowfell was an enjoyable read for me; it reminded me of the fantasy novels I loved so much as a young girl, with a magical kingdom and a mysterious warrior on horseback and a courageous heroine whose mettle must be tested before she can find her destiny. Alban is beautifully drawn, evocative of a modern Britain while simultaneously conjuring forth an more ancient time of Celtic myth, when magical creatures lived alongside humans graced with mystic powers and abilities.